This wonderful Felgemaker pipe organ was built originally for a church in South Carolina. An earthquake hit that area of the United States and the church was damaged to the point that they were not able to accept the organ. The boat was in Ripley on the Ohio River traveling to South Carolina, when the boat captain received the message of the damage. 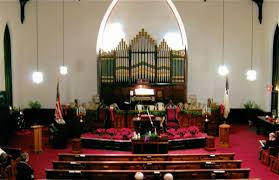 The Presbyterians purchased the organ for $1500.00. Ripley First Presbyterian church is blessed every Sunday as music from this wonderful instrument fills the sanctuary.